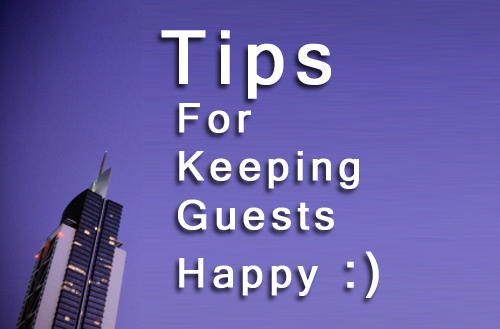 How do you keep your guest happy in your hotel? What can you do for your guests that will make them so happy that they can’t wait to get home and tell all of their friends just how great an experience they had at your hotel? Every manager wants to keep their hotel guests happy because a happy hotel guest will want to come back and stay again. There is no better advertising than a glowing testimonial from a satisfied guest. A well-designed marketing plan can draw new visitors to your hotel. You can attract new visitors to your property through social media, direct mail and fancy brochures. Once you get people to your hotel, you have to give them a good reason to want to return. Hotels with great management and great employees think creatively and do the little extra things that make hotel guests happy. What are the things that make a real difference? Making a good impression when your guests first arrive can set the tone for their stay. If a guest has to wait twenty minutes to check-in, they obviously will start to wonder if they came to the right place. Make sure your front desk is well staffed and well-trained to welcome guests. Visitors may be tired and a little grumpy from traveling all day to get to your hotel. If there is a delay, make sure you let everyone know that you are working hard to move the line along. Offer them some cold drinks and maybe a small snack while they wait. We have all heard the expression that the way to a man’s heart is through his stomach. Well, that same thought applies to both male and female hotel guests. A complimentary breakfast is almost expected these days. If you really want to impress your guests and make them happy, why not install a custom omelet station in the breakfast area. Let guests start their day by telling your friendly chef exactly what ingredients they want mixed in with their eggs. You won’t believe the number of positive responses you will get! A free breakfast is fine, but what about the rest of the day? Offering fresh-baked cookies or an evening glass of wine will separate your hotel from the others. An on site restaurant, open early in the day and late into the night, is a big bonus. Not every hotel has their own restaurant or the facilities to offer room service, but some hotels go the extra step to make arrangements for food delivery from local restaurants. A coffee pot with premium coffee in every room is a small amenity that makes a difference. Consider adding a well stocked minibar and make sure there is ice, soda and snack vending machines on each floor. Being a kid-friendly hotel is very appealing to people on vacation with their small children. While most hotels will rent you a crib for an extra charge, there are many other small things that will have Mom and Dad smiling. Keep kids happy by offering video games and age-appropriate movies. For younger kids, a hotel should offer electrical socket protectors, free loaner strollers and maybe some baby suntan lotion with the little shampoos and soaps. To make kids really happy, surprise them with a small toy or gift upon check-in. After spending all day sitting through boring lectures or meeting with clients, businessmen like to come home to their hotel room and relax. Having a swimming pool and an exercise room is a great way to release stress. Parents can get some peace and quiet by sending their kids to the hotel’s game room. Everybody is happy when they have fun things to do. Hotels earn a good portion of their profits by welcoming business travelers. You can make your hotel business friendly by offering free wireless service and having a business center where people can use the internet, read email and catch up on their important work. Inside each guest room, you should have a comfortable work area with a convenient charging station for the different electronic gadgets that most business travelers carry. Concierge service may be a fancy title, but even smaller hotels can provide some extra services that make a guest’s arrival and stay more pleasant. In Las Vegas, many hotels offer free shuttle service to and from McCarran International Airport. They also have a booth set up by the front desk where guests can arrange for rental cars, buy tickets to shows or make a reservation for a golf tea time. Guests, especially business guests, are happier when they do not have to worry about making all of the small arrangements on their own. Guests do not want to have to worry about flagging down a housekeeper to get a few extra towels or another bottle of shampoo. Not everyone wakes up at seven in the morning and goes to sleep at ten in the evening. If you want your sheets changed at two in the morning, for some strange reason, a hotel’s housekeeping department should be able to accommodate you. When your hotel goes beyond expectations, guests notice the attentiveness and it will make them happy. When guests are ready to check-out, it is your chance to leave them with a good impression of your hotel so they will want to return the next time they are in the area. Be friendly, ask them how they enjoyed their stay and invite them to come back again. If you follow-up a few weeks later with a personal thank-you note, it will make them feel like you really care that they had a happy stay at your hotel. The happier the hotelier, the happier the guest. Running a hotel is all about people. When you make an extra effort to show that it is more important that your guests are happy than it is to make money, you will be generously rewarded with happy guests and high bookings. I agree with all your points having good services for the customers so that they can relax and enjoy is really an essential part for any hotel to become popular. The services should be top notch and according to the latest need of the customers. good information about how to keep guests happy at hotel.one can also hire las vegas concierge services to keep guests happy. I am not sure if I agree with everything in this article although I empathise with the basic sentiment. The biggest mistake you can make is to try to be all things to all people as per this article. Be children friendly whilst attracting the business traveller is a recipe for disaster. I am not sure how many business people appreciate screaming kids at breakfast or being woken up by the sound of a 6 months-old-baby crying at 3am next door when the Business Traveller has a meeting to go to first thing in the morning. Well stocked Mini-Bar? Every article including TripAdvisor’s most recent survey says, guests do not care for them. Worst still is that only 8% would be influenced by whether you have a mini-bar in the room or not. Don’t waste your money and ditch the mini-bar. Quality breakfast that is included in the rate is a big hit and key in decision making for guests. Never call it Free. People are’t stupid. They know there is nothing for free. Be honest and call it what it is “Included in the price”.